OMNIA STANT HARMONIA. Anarmonia cadunt omnia. Nec erigitur, reficitur, restituitur quidquam, nisi ad Harmoniam relatum atque redactum. All exists through Harmony. Disharmony destroys all. Nothing can be built, nothing created, nothing restored that is not related to and based on Harmony. Tout existe à travers l'Harmonie. La disharmonie détruit tout. Rien ne peut être construit, ni créé, ni restauré qui n'est pas lié à et basé sur l'Harmonie. In "Farben Project", the German word "Farbe" ("color") refers to "Klangfarbenmelodie", a musical technique involving splitting a melody between several instruments, rather than assigning it to just one instrument (or set of instruments). The aim was to add color (timbre) and therefore alternative texture to the melodic line. This technique derives from Arnold Schoenberg and his "timbre-structures" and was also used by Anton Webern. With the "Farben Project", my first aim is to integrate color into music and this by three methods : (a) aligning standard pitch with natural process, (b) relating the chromatic scale (and on the basis of this also the harmonic series of each tone) to the visible spectrum of light and (c) allowing scalar coloration, or the return of "key characteristics" to the 24 keys of the tonal system of harmony (by reintroducing pure intervals). Secondly, on the basis of this naturalization and reintroducion of scalar coloration, define a psycho-acoustic model, in other words, establish guidelines allowing music to entrain the minds of its listeners (AVS) in the direction of a life more in harmony with the beauty of the natural order. Music, derived from the Greek "mousike" or "art of the Muses", is an artistic phenomenon whose medium is well-formed sound in combination with its absence (silence). This definition of music begs the question : "What is art ? ", a topic involving a complex network of concepts studied in Aesthetics (2013). Three ways to define "music" can be identified : (1) intrinsic, (2) (inter)subjective and (3) intentional. • Intrinsic, objectivist definitions try to pinpoint the objective aural properties of musical sound as opposed to mere noise, for example specific frequencies. But if we want to include "out-of-tune" sound-sources (like machines), different Western & non-Western musical (microtonal) scales, "untuned" percussion and works lacking basic "musical" features (such as pitch or rhythm) -like Yoko Ono's Toilet Piece/Unknown- then the intrinsic definition becomes too extended, for indeed both non-musical noise and musical sounds have frequency. However, it cannot be denied "music" has certain "musical" properties, of which frequency (pitch) and temporal pulse (rhythm) are the most basic, and this together with dynamics (loudness, intensity), timbre (tone-color), verticality (harmony), horizontality (melody, counterpoint) and format. • (Inter)subjective definitions identify music, regardless of intrinsic properties, as whatever sounds like or is perceived by a listener or a group of listeners as music. Can one say Beethoven's Fifth Symphony stops being music for listeners ignorant of Western culture ? Can I reasonably deny Rembrandt's The Night Watch to be a painting ? Can I miraculously transform the noise of a drilling machine into music by merely hearing them in a certain way ? And what about music emitted by a radio nobody is attending ? Does this stops being music (while it remains music for the neighbour next door) ? Clearly all of this is counterintuitive. Too much subjectivism (like exclusive objectivism) leads to problems. • Intentional definitions focus on music-making intentions of those responsible for the noises or sounds. Not the listener is important, but the intent of the human sound-source. Intentional action has been defined as "the execution and realization of a plan, where the agent effectively follows and is guided by the plan in performing actions which, in manifesting sufficient levels of skill and control, bring about the intented (i.e. planned) outcome." (Livingston, 2005, p.14). This definition helps to include works of silence, like John Cage's work 4'33". So-called music produced by machines (CD players, iPods, etc.) is rooted in the intentions of the musicians behind the sounds. Even computer-generated scores are designed by someone, even if the outcome is unpredictable. The same goes for aleatoric music (or passages) and improvisations. So these are covered by the definition. Sounds generated by animals however, although they sound like music, lack the capacity for complex intentions and so do not improvise or invent new melodies. These sounds fall outside the definition. They are music-like without actually being music. In the definition of what is music, both intrinsic & intentional approaches will be combined. From the intrinsic strategy we retain the presence of objective musical features. This begs the question : What are objective musical features ? From the intentional approach, the importance of a human source for acoustic events is adopted. An extended & strict form of the definition is proposed. In sensu lato, all types of sound (combined with silence) are allowed, whereas in sensu stricto, only well-formed sounds are taken into account. Music is any event intentionally produced to be heard, either to possess intrinsic musical features or to be listened to for such features. By saying "any event intended to be heard", the definition includes both sound & silence. If we want to include machine-noise etc. intended to be part of a musical work (like Honegger's Pacific 231), then the musical event is not limited to well-formed sound. The disjunction in the definition allows one to call works like Toilet Piece/Unknown "musical" for indeed the toilet is flushed with the intent to discover musical features, even if such features are objectively lacking (but projected upon the acoustic phenomenon by intent). According to this definition, some sonic works of art are not musical in any way (cf. John Cage's Williams Mix for eight simultaneously played independent quarter-inch magnetic tapes). Hence, not all sound art is music ! Music is a well-formed sound (combined with silence), intentionally produced to be heard. The restriction here is the condition of well-formedness, excluding all sonic works of art lacking all or some intrinsic musical features such as pitch, rhythm, dynamics, timbre, melody, harmony & format. Unpitched instruments form an exception, and may be included, but only in combination with pitched instruments. A sonic artwork exclusively generated by unpitched instruments is excluded. So is Toilet Piece/Unknown, despite Yoko Ono's intent, as well as Cage's 4'33". This definition includes Western & non-Western sonic works making use of microtonality (Indian Râgas, works of Harry Partch). If the concept of well-formedness is stretched to include pitched or unpitched noise (like that produced by machines, trains, traffic etc. ), then music is at hand if and only if this noise is combined with less random (read : more traditional) sources of sound (like musical instruments). In this case, the overall balance between noise & sound needs to be checked in order to know whether music is at hand or not. There are two types of sound : musical sound & noise. Let this crucial initial distinction be rooted in the physical (material, efficient) difference between irregular & regular sound waves. Everything around us, our body included, vibrates in a certain pattern and transfers these vibrations to the surrounding medium. When these vibrations disturb the medium in a periodic way, a portion is repeated over and over again, i.e. with repetitions at equal time intervals. One cycle of this periodic motion is called a wave, characterized by a high point (crest) and a low point (trough). Sound is a longitudinal wave, i.e. an oscillation of pressure transmitted through a medium (like air or water) causing the particles in the medium to vibrate parallel to the direction in which the wave is travelling, and composed of frequencies within the range of hearing. The speed of sound is proportional to the square root of the ratio of the stiffness of the medium to its density. In dry air at 20° C (68 °F), the speed of sound is 343.2 metres per second (1.126 ft/s), or about a kilometre in three seconds (a mile in five seconds). The moment musical is a single temporal unit not exceeding three seconds, the time span of immediate consciousness. This is the specious present, the time duration wherein one's perceptions are considered to be in the present. In this moment, earlier may be distinguished from what is later, but both past & future are directly given, simultaneously present to consciousness. So the "present", events perceived in the first time, is not merely a non-existent gap between before and after. When an object vibrates, waves of increased and decreased pressure in the air are caused. It is not the case of a particular molecule of air moving in the direction of the wave at this speed. Rather, the local disturbance to the pressure propagates at this speed. This is similar to water. No particular piece of water moves along, but the disturbance of the surface propagates. However, in the latter case the local movements are up and down, and so at right angles to the direction of propagation (transverse waves). Sound moves in the same direction as the propagation (longitudinal waves). A sound wave travels through the air, hits the eardrum and allows one to hear the sound. Human hearing is normally limited to frequencies between about 20 Hz and 20.000 Hz. Compare this with a turtle (20 - 1000 Hz), a dog (50 - 45.000 Hz), a cat (30 - 50.000 Hz) and a dolphin (1000 - 130.000 Hz). The human ear can distinguish a difference of 1 - 2 Hz. Sound waves (and waves in general) are characterized by frequency, amplitude, wavelength & period. The frequency (f) is the number of waves passing a given point per second and measured in Hertz (Hz), with 1 Hz = 1 vibration/second. The amplitude (A) of a wave is the maximum displacement from the equilibrium position (the original position of the sounding body). The wavelength (λ) is the distance between any point on the wave and the corresponding point on the next one (or the distance the wave travels in one cycle). The period (T) is the time it takes for one whole cycle to pass a given point. Period & frequency are reciprocals, with T = 1/f. A sonic environment is composed of many different sound waves emitted by a variety of sound sources. Interacting, they usually produce irregular sound-ripples, causing a cacophony. This mixture of sounds is discordant & harsh. It is generated by vibrations producing irregular sound-ripples. These complex pressure ripples have no or little relationship to each other and therefore clash. Instead of co-operating, as in a team, they as it were "beat each other up", increasing the irregularity of their interactions. Irregular sound waves are never well-formed. Hence they are called "noise". In the common aural chaos surrounding us, regular sound-ripples are very noticable, they stand out, are uncommon. Always working together, these waves reinforce each other, and generate strong resonance in any sonic environment. When, as in a musical performance, surrounded by total silence, these regular sound waves immediately reveal their exceptional status. But in the sonic environment, these well-formed sounds constitute but a small subset of all possible sounds. And to generate these musical sound waves special tools are necessary. Although music imitates (cf. the Harmonic Series) fundamental natural phenomena (like φ), these sound waves are always the symptom of a degree of culture accommodating the production of cultural forms, in casu, musical works of art, the first of which were very likely composed ca.30.000 BCE (date of the oldest instruments - Davies, 2014, p.70). So music can be understood as a finite number of musical sounds generating regular sound-ripples interacting & working together to produce an organized and hence well-formed sound. The objective musical features or attributes are therefore certain phenomena contributing to a musical sensation as opposed to other aural sensations, such as sonic works of art using noise & various degrees of noise. The history of music around the globe evidences seven musical features denoting music in objective terms : pitch, rhythm, dynamics, timbre, horizontality (melody, counterpoint), verticality (harmony) and format (musical architecture, overall layout or plan of a piece). Together, these seven intrinsic features define music as an objective, sounding form (cf. Hanslick's "tönend bewegte Formen"). This as opposed to noise, or unmusical sound. Of these seven objective features, two are fundamental : pitch & rhythm. Pitch is fundamental, for it is the qualitative attribute of auditory sensation denoting highness or lowness primarily conditioned on the frequency of sound waves. We do not hear this rate of vibration of musical sound waves, but only a "musical tone". Pitch determines spatial organization. Next comes temporal motility, defining the durations of pitches, known in music as rhythm (tempo, time). With both, the foundational spatio-temporal sphere of music is set. Loudness speaks of the intensity of certain sound waves relative to others, whereas timbre is a function of the instruments generating the musical sound. The horizontal, vertical and integral features are meta-properties based on the distribution of pitch, rhythm, dynamics & timbre. Format is called "integral" because it involves the organized layout of all the musical events constituting a work of music. Well-formed sound (and its absence, silence) are the medium of music. The musical phenomenon is an object of human valuation fulfilling specific determined aims. Its conscious perception (acoustic & kinesthetic) -as well as music's unconscious impact on the whole body through resonance- leads towards the elaboration of conjectured meanings, in casu : what is a well-formed sound ? Music is an intentional phenomenon. It is the object of human valuation because it belongs to the interests of an individual, a group or humanity as a whole to define what is music and what it is not. Let us focus on pitch, the most objective of the intrinsic properties of music. In music theory, the word "note" refers to a sign, say G, calling for pitch (frequency), relative loudness (amplitude), duration (rhythm) & timbre (quality or shape of the frequency spectrum of the sound wave). In acoustics, G implies a pitched musical sound, i.e. a specific steady periodic oscillation called "tone". As a note, G always calls for a functional discussion about its relationship with other notes. The note G is the tonic in the key of G or g, the mediant in E or e and the dominant in C. In each case, for the same G, another functional relationship with the other notes of the scale is given. The concept "note" is therefore contextual. G as a tone is just a matter of frequency, and this independent of context. (1) spatial : how high or low is the frequency ? (2) temporal : how long is the frequency operational ? (3) intensity : how strong, how much energy carries the frequency ? (4) timbre : which instrument generates the frequency ? The common element is frequency, the number of waves passing a given point per second (in Hz). When tones are combined, the meta-dimensions come in : harmony, counterpoint & format. Tones may sound simultaneously, generating a vertical relationship (harmony), or one after the other, inviting a horizontal dialogue (melody and by extension counterpoint). Finally, format defines layout and plan. This is the last dimension : architecture. All together they define an actual musical form existing in the moment musical. In musical practice, secondary frequency features are also present, such as attack transients (high amplitude, short-duration sound at the beginning of the wave), vibrato (a musical effect consisting of a regular, pulsating change of pitch), envelope modulation (the so-called ADSR-factor, or the "Attack Decay Sustain Release" specifics of an instrument) and reverb (impact of performance space on the sound). They are used with great care & moderation. Sounding a single tone is not yet music, but merely the most elementary building-stone of music, a well-formed sound generated with vibrations collaborating to produce a regularly repeating sound-ripple, i.e. vibrations strongly related to each other and joining together in an organized way. The most forward way to generate a single tone is making a single string (monochord) vibrate or a column of air do the same. All musical tones, besides electronically generated "pure" tones, are complex, i.e. formed by adding an infinite number of component waves, each having a different frequency. This infinite set of frequencies is divided into two : the fundamental frequency and the others. The fundamental is the dominant frequency, the one best heard and somewhat overpowering the others. These are always integer multiples of the dominant frequency. A musical tone consists of a fundamental frequency component plus other frequency components (in "pure" tones, only the fundamental frequency is present). These frequency components (fundamental + other frequency components) are called "partials" (or "parts" of the total, infinite spectrum of frequencies constituting a musical tone). The xth partial of a tone is the xth frequency component counted from the bottom. So the first partial, the one with the smallest frequency, is the fundamental frequency or fundamental (f) of the tone. All frequency components besides the fundamental frequency (first partial) are "overtones" ; they never include the fundamental frequency. As the frequencies of the overtones of a tone are integer multiples of its fundamental frequency (2f, 3f, 4f, ...), order & balance is evidenced and so all partials (all frequency components) are called "harmonics" ; the fundamental frequency being the first harmonic. The component with frequency xf is called the xth harmonic or (x - 1)th overtone. With x = 1, we obtain the first harmonic (= first partial), i.e. the fundamental. There is no overtone (x = 1 - 1 = 0). The first overtone is the second harmonic or the second partial. With x = 3, we obtain the 3th harmonic or second overtone. Simply put : overtones = harmonic - 1 and so harmonics = overtones + 1. The series of harmonics, from the first harmonic up to the xth harmonic is called the Harmonic Series. In theory, an infinite number of harmonics exist, but in practice the first sixteen harmonics are considered, of which the first six are crucial to tone-formation and vertical (simultaneous) interactions between tones (harmony). When the totality of the frequency spectrum of a tone is at hand the term "harmonics" will be used (as in acoustics), but when the dominant influence of the fundamental frequency is considered, "overtones" are indicated (as in sound engineering). From the physical point of view, musical sounds are "musical" because these pitches have regular ripple-patterns. This regularity is obvious, for all frequency components besides the fundamental component are integer multiples of the latter. Of all the frequency components of a tone, the fundamental frequency, first harmonic or first partial is the dominant frequency. From the informational & sentient perspective, "music" also operates the other six dimensions besides pitch, namely duration, tone quality (sonance), verticality, horizontality and integrality. Let it be clear sound waves with irregular ripple-patterns or noise lack this harmonic feature. Noise is inharmonic. All the frequencies of a single musical tone or pitch are in "harmony", i.e. work together in a unity promoting difference. The fundamental frequency defines the foundation of a tone, but also contains overtones (the fourth & the fifth) generating the basic structure of the triadic relationships at work in verticality (tonal harmony). The Harmonic Series of C contains E & G, forming the tonic triad of C Major. Two tones with the same fundamental frequency are in unison and totally blend together, producing a fusion with no interference between them. In general terms, when two sound waves interfere, they sometimes combine, making a louder sound, and sometimes partially or fully cancel each other out, producing a softer sound. This pulsating pattern of louds & softs is called beats. For example, given sound wave X has a pitch of 50 Hz and sound wave X' a pitch of 55 Hz, then 5 beats per second are heard. Now when the pitch of one of two tones of the same fundamental frequency is slightly increased, then the number of beats heard per second also increases, creating discord. Maximum discord or dissonance is generated when the beat frequency (the difference between the two fundamental frequencies) is about 25 or 30 Hz. Beyond that, this decreases, to finally disappear. When one tone has a fundamental frequency double that of another tone, they form an octave and no beats are heard either. Unison & octave are the two universally recognized fundamental consonant intervals between two tones. Defining other tone-relationships than unison & octave is answering the question of how to divide the octave. This is another crucial initial distinction. "Accordingly, in all known tonal systems, the basic basic scale-patterns, with few exceptions, fill in the space between two tones an octave apart." - Hindemith (1942, Book 1, p.15). Is there an absolute way to know whether two tones played on a single instrument or two tones played by several instruments simultaneously are "in tune" relative to one another ? To answer this, we need to know the fundamental frequencies of the tones in question. This depends on the frequencies attributed to them and this is necessarily defined by a standard. In terms of notation, this means we need to know which frequencies to attribute to which note. Put technically, and by consensus, we need to know the fundamental frequency of A above middle C, the so-called "master tuning" or "standard pitch". This is the frequency all instruments are set to (sound this A). This frequency is usually "locked" in a tuning fork, a relatively stable tuning device invented by John Shore in 1711, and used to tune instruments before Hertz came along (tuning forks aim to let the fundamental frequency ring through at the expense of the other partials). The fact these forks survive, allow us to reconstruct these historical master tunings. In the orchestra, the oboe is used to "sound the A" because this instrument has fixed, factory-tuned tones. At a conference held in May 1939, the British Standards Institute endorsed A4 above middle C (C4) to correspond to 440 Hz. One has only to recall history to realize this was a conventional decision. In Germany, prior to 1600, organ pitch is thought to have varied from A at 567 Hz for the first simple pipe organs of the Middle Ages, to A at 377 Hz for the early modern German organ around 1511. Handel (1751) favoured A = 422,5 Hz, Mozart (1780) A = 421 Hz (Mendel, 1968). Scientific pitch, also known as "philosophical pitch" or "Sauveur pitch", with A = 430,54 Hz, was first proposed in 1713 by French physicist Joseph Sauveur. Pleyel's piano's (1836) were at A = 446, Giuseppe Verdi considered A = 432 Hz to be better. In 1859, the French Government made the "diapason normal" or A = 435 Hz law, whereas in 1896, Britain adopted "philharmonic pitch" or A = 439 Hz. In 1925, the American music industry adopted A = 440 Hz. In November 1955 and in January 1975, the International Organization for Standardization reaffirmed A = 440 Hz. In 1989, over a dozen of opera singers -including Placido Domingo & Luciano Pavarotti- added their names to a petition before the Italian government, asking them to lower the standard pitch from A = 440 Hz to A = 432 Hz. In their view, A = 440 Hz is one of the main reasons for the crisis in singing, giving rise to "hybrid voices" unable to perform the repertoire assigned to them ... Apparently, the issue of standard pitch is a fundamental discussion in music. The objective solution to this problem proposed here is derived from the structure & function of the human ear, in particular the φ shape of the outer ear and the cochlea (inner ear), as well as the function of the latter (cf. φ dampening). The Golden Ratio φ = (1+√5/2) ≈ 1,618033988749894848204586834 ... is part of so many natural processes it has been called the "Divine proportion". Indeed, the ratio is expressed in the arrangement of branches along the stems of plants, in the veins in leaves, in the skeletons of animals, in the proportions of chemical compounds, in the geometry of crystals, in the magnetic resonance of spins in cobalt niobate crystals, in the human genome DNA, etc. In Zeising's Law (1854), the Golden Ratio permeates all structures, forms and proportions, whether cosmic or individual, organic or inorganic, acoustic or optical and finds it full realization in the human form. φ is also closely related to the Fibonacci numbers (Fn), Fibonacci series or Fibonacci sequence. These are the numbers in the following integer sequence Fn : 1, 1, 2, 3, 5, 8, 13, 21, 34, 55, 89, 144, ... defined by Fn = F(n-1) + F (n-2), whereas Fn = φn-(-φ)-n/√5. In the inner ear, the purpose of the φ-shaped cochlea is to separate out sound into various frequency components before passing it unto the nerves. This makes the functioning of this body of great interest in terms of the harmonic content of a single note in particular, as well as music in general. Can it therefore be mere coincidence E3 = 161,817 Hz (or φ) when A4 = 432 Hz ? Clearly not. No other Master Tuning generates φ. Because A = 432 Hz, or "Verdi Pitch", aligns with φ, this Master Tuning may be considered an objectivation of standard pitch on the basis of acoustic law in general and the mechanism of human frequency processing in particular. These are natural phenomena, not cultural. Master Tuning A = 432 Hz is therefore the Natural Master Tuning. When the objective & subjective parameters of acoustics are not followed (moving away from A = 432 Hz), we interfere with these natural lines of communication between sound-source & sound-receptor, thus placing additional stress on the sense of hearing, and this for reasons beyond those related to the optimalization of Master Tuning in terms of musical sound. Tones are always harmonics and our ear differentiates frequencies on the basis of φ. As we humans are capable of hearing a difference of 1 to 2 Hz, one cannot claim this matter futile. Given the Harmonic Series (on the side of the object, the sound-source) and the hearing apparatus (on the side of the subject, the sound-receiver, the hearer) are defined by φ, it stands to reason music should best adopt Verdi Pitch and not some arbitrary standard facilitating an industry. Given most, if not all, music today is tuned to A = 440 Hz, we may digitally retune (using quality software like Melodyne Editor). The fact top singers prefer A = 432 Hz should not be considered whimisical. "The eye perceives in light which has been split up by a prism a natural series of vibration frequencies. The light of the sun always produces the same immutable series of colors, familiar to us in the rainbow. Now, just as light consists of graduated colors of the spectrum, so a tone consists of many partial tones. Spectrum of the world of sound is the harmonic or overtone series. A tone produced by a voice or instrument carries with it a greater or lesser number of barely audible overtones. Their order is not arbitrary : it is determined by a strict law, and is as immutable as the color series of the rainbow." Hindemith (1942, Book 1, p.16). As the Greeks (following Pythagoras & Plato) considered all phenomena to be ruled by numbers, the correspondence between (regular) musical sound (defined by fractions) and the regular movement of the planets seemed self-evident. Today, this notion of "music of the spheres" (Musica Universalis), even cherished by Kepler, may be used as a heuristic tool to help us discover significant (in a material, information, sentient sense) unexpected correlations between natural phenomena, in casu, between visual elements, such as colors, and aural phenomena, such as tones. Can pitch be related to color ? To extend the Pythagorean idea of the "Harmony of the Spheres", encompassing planets, tones and colors, Plato linked the intervals of a major second and a perfect fifth to yellow and the perfect fourth to red. 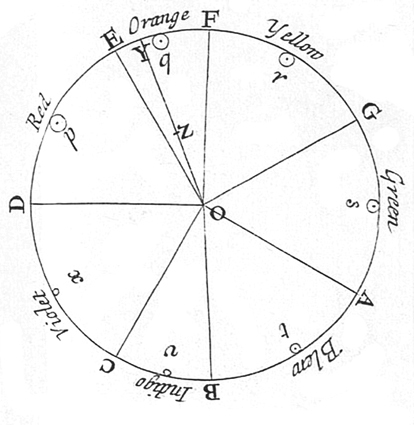 Aristotle also suggested a parallel between the harmony of colors and the harmony of musical intervals. To directly attribute color to notes, various systems have come into existence, either based on an objective measure (Newton in his Opticks, 1704) or on the subjective experience of color. The latter tradition is based on Goethe (Zur Farbenlehre, 1810). "Goethe's theory of the origin of the spectrum isn't a theory of its origin that has proved unsatisfactory ; it is really not a theory at all. Nothing can be predicted by means of it. It is, rather, a vague schematic outline, of the sort we find in James's psychology. There is no experimentum crucis for Goethe's theory of color." - Wittgenstein, L. : Bemerkungen über die Farben, 1950. In Newton's circle, the spectral colors from red to violet are divided by the notes of the musical scale, starting with D (Dorian). The seven spectral bands are associated with the seven tones (dividing the octave). The circle completes a full octave, from D to D. Newton's circle places red, at one end of the spectrum, next to violet, at the other (non-spectral purple colors are observed when red and violet light are mixed). Newton's name for "indigo" is what today is called "blue", whereas his name for "blue" is what today is called "cyan". Why D is used remains unclear. This, together with the absence of numerical correspondences between colors & tones (frequency), makes Newton's scheme somewhat arbitrary. The question before us : can the notes of the chromatic scale, each representing a specific tone and therefore frequency, be correlated with the spectral colors ? An intriguing numerical correspondence between the pitch or frequency of the notes of the chromatic scale & the colors of the visible light spectrum can indeed be observed. This is the basis of the objective measure proposed here. The visible light spectrum is a section of the electromagnetic radiation spectrum visible to the human eye. It ranges from ca.380 nm (3,8 x 10-7m) to ca.750 nm (7,5 x 10-7m). The wavelength of light or λ, measured in nanometers (nm) or Ångstroms (1 nm = 10 Å) is what determines the perceived color. The frequency of light (f) defines the number of waves occurring in a given amount of time. Hence, waves become shorter as the frequency becomes higher, or : λ = c/f, with the speed of light c = 299.705 km/s. As the color bands blend, their precise lengths vary a little. Hence, their boundaries are approximate, for the color spectrum is continuous. Nevertheless, frontiers are present as anyone can see, although a small measure of arbitrariness cannot be avoided. Compare the wavelengths of visible light (defining color), measured in nanometers, with the frequencies (defining tone pitch), measured in Hertz. The wavelength bands given below give rise to a "centre of color gravity" (Newton) or "color center wavelength", the mean value of the color band. This wavelength is numerically compared with the frequencies of the notes at International Pitch (A4 = 440 Hz) & Verdi Pitch (A4 = 432 Hz). Their measure of numerical correspondence is then calculated. (*) numerical difference between Centres of Color Gravity and Tone Pitch. Examples : for VIOLET (A = 432) : 390 - 384,868 = 5,132 ; for VIOLET (A = 440) : 391,995 - 390 = 1,995 ; (**) percentual numerical correspondence between Centres of Color Gravity and Tone Pitch. Examples : for VIOLET (A = 432) : 100/390 x 384,868 = 98,7% ; for VIOLET (A = 440) : 100/391,995 x 390 = 99,5%. Counting the times International Pitch scores better than Verdi Pitch we get 3, whereas Verdi Pitch is 9 times closer to the heart of the hue. In International Pitch, C5 falls outside the color interval. On average, Verdi Pitch is 98,95% corresponding (with a standard deviation of 0,17), whereas International Pitch is 97,9% corresponding with a much larger standard deviation (σ = 1,33). The strength of the linear association between the two variables R (centre of color gravity & tone pitch with A = 432 Hz or A = 440 Hz) is R = 1, or strong correlation (Pearson). "The structure of the true octave is derived from the overtone series, from which nothing more complete than the comprehensive building material furnished by the chromatic twelve-tone scale can be developed." - Hindemith (1942, Book 1, p.52). Both scientists & artists have disputed the validity of the alignment. However, it cannot be denied a proportionality and strong correlation is at work here. Can this be applied to the harmonic series ? In music, the harmonic series is an acoustical phenomenon defined by a sequence of pitches related to a lower pitch. This is a sequence of successive intervals : octave (2:1), fifth (3:2), fourth (4:3), major third (5:4), minor third (6:5), two intervals between a minor third and a whole tone (7:6 & 8:7), a large whole tone (9:8), a small whole tone (10:9), a minor second (16:15) and progressively smaller intervals ad infinitum. For example : take a long string or tube (1:1), then the ratio of 3:2 implies a string or a tube of 2/3 length will sound a fifth higher in pitch than the longer one. At one and a half times the lenght will sound a fifth lower. The prevalence of the octave, fifth, fourth, major & minor third in the lower part of the series contributed to the development of the concept of harmony. 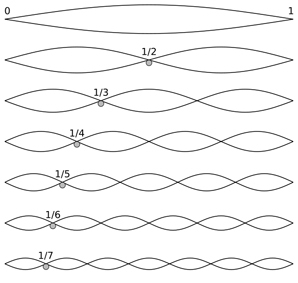 The intervals of the harmonic series are called "harmonic intervals" and they are all acoustically pure (beatless). When an instrument plays a single musical tone, a whole frequency spectrum is generated. It consists of a fundamental frequency (the 1th harmonic or 1th partial) and all the overtones present together with the fundamental tone. A "harmonic" is an integer (whole number) multiple of the fundamental frequency of a vibrating object. The noise of a drill also generates a series of overtones, but these clash and beat each other up. Musical tones satisfy the conditions of harmony and so the overtones work together with no beats. The harmonic structure of the overtones assists in understanding how one tone may move towards another tone (as in an actual harmonic progression). Suppose this is a string vibrating at 110 Hz. When it divides itself up in two halves, these vibrate at 220 Hz. Divided into three thirds, each vibrates at 330 Hz. Divided into four quaters, each vibrate at 440 Hz. etc. All these vibrations and lots more happen at the same time, repeating a whole cycle at the lowest, fundamental frequency involved. Not only do these overtones define the timbre of tones (primarily by way of the relative amplitudes of the various harmonics), they are crucial to understanding the natural harmonic rules of Western tonal harmony, i.e. a harmonic logic based on the properties of the harmonic series of every musical note sounded (Hindemith). The Harmonic Series, defining precise mathematical proportionality, is (together with the energy or amplitude of the soundwave), the foundation of every musical tone. It operates a precise & fixed mathematical relationship between : 1) all the partials of a tone (the frequency components of a tone, i.e. fundamental frequency plus overtones), 2) the frequency ratio of a tone, 3) the frequency in Hz of a tone and 4) the harmonic interval to the previous tone. TABLE 2 below has the 16 Harmonics of C, with the corresponding colors for the partials based on the analysis above (TABLE 1). The notes in bold have a large offset (in cents). Bb4, F#5 & Bb5 are lower (-) than indicated, Ab5 is higher (+). The frequencies of the overtones are calculated with the fundamental frequency as their basis (here C2). For example, the 16th Harmonic has a frequency of 1027,472 Hz or 64,217 Hz x 16. All values in Hz are based on A4 = 432 Hz, or C2 = 64,217 Hz. There are two types of harmonics : odd-numbered (1th, 3th, 5th, 7th & 9th etc.) and even-numbered (2th, 4th, 6th, 8th, 10th etc.). The presence & power of these in the frequency spectrum defines the "timbre" of instruments. In clarinetes, the typical harmonics are the odd-numbered, whereas in the flutes, even-numbered predominate. "... the chromatic scale can be derived just as simply from the overtone series ; that, since it makes exhaustive use the clearest overtone relations, it has an even more natural basis ; and that it is thus the most natural of all scales, and the best adapted to melodic as well as to harmonic use." - Hindemith (1942, Book 1, p.48). The higher the harmonic, the less it is heard. Each octave in the harmonic series is divided into increasingly "smaller" and more numerous intervals. The first eight harmonics define the tone and also contain the fundamental triad (tonic) of the tonic scales erected on it, the gravity of the tone. The intervals (to the previous tone) defined by the harmonic series are "pure" & "just", i.e. in accordance with natural law, i.e. unison (1/1, frequency ratio : 1:1), octave (2/1, frequency ratio : 2:1), fifth (3/2, frequency ratio : 3:2), fourth (4/3, frequency ratio : 4:3), major third (5/4, frequency ratio : 5:4) & minor third (6/8, frequency ratio : 6:5). The frequency ratios of the first 6 harmonics (1 - 6) define the acoustico-numerical proportions of 5 important intervals (or distances between two notes). These are the harmonic intervals or "perfect" consonances. The first 4 harmonics (first three overtones) define harmonic octave (= 2:1, C - C), harmonic fifth (= 3:2, C - G) & harmonic fourth (= 4:3, G - C). The intervals of a harmonic fifth & a harmonic fourth make an octave (3:2 + 4:3 = 12/6 = 2:1) The harmonic fifth & the harmonic fourth are relatively beatless. As the 3th harmonic has an offset of +2c, they do have a beat, but one imperceptible to the human ear (able to distinguish a difference of 5 to 6c). Only the harmonic octave is absolutely beatless. This is why the 1th harmonic is the fundamental frequency of the tone, the backbone of the harmonic series in question. Pure, perfect intervals like harmonic octave, harmonic fourth & harmonic fifth are intervals with zero beat or a beat below 5c. Harmonic octave & harmonic fifth are consonant intervals. Depending of context, the harmonic fourth can be dissonant or consonant (in fact, C - F, the fourth from the root) is not part of the harmonic series (instead F# is the 10th overtone, but with an offset of -48,68c) ! In the Harmonic Series, the fundamental with 2 overtones (1th, 2th & 3th harmonic) is followed by the harmonic major third (= 5:4, C - E) and the harmonic minor third (= 6:5, E - G). The harmonic third has two forms : major & minor. The difference in size between these two harmonic thirds is a harmonic minor second. The harmonic thirds too are beatless. The intervals of a major & minor harmonic sixth do not occur between adjacent partials. To identify them, we need to leap. The harmonic major sixth has frequency ratio 5:3, the harmonic minor sixth 8:5. Because of their mixed formats (major versus minor), these 4 intervals are all "imperfect" consonances. The frequencies of the Harmonic Series, being integer multiples of the fundamental frequency, are naturally (bio-acoustically) related to each other by whole-numbered & small whole-numbered ratios. This is the basis of the consonance of musical intervals. The Harmonic Series diverges in a way like the Fibonacci sequence does and can be rearranged with limit points integrating the Golden Ratio (φ). The auditive (bio-acoustic) & psycho-acoustic impact of forcing the ear to adjust to a non-φ based Master Tuning (like A4 = 440 Hz) is therefore questionable. The objective, natural form of the Harmonic Series (comparable to φ) is best assisted by a standard frequency based on φ, thereby stimulating an ear constructed by way of φ. In this way, source, medium & receiver are co-relatively attuned. The fundamental frequency of the notes are based on A4 = 432 Hz or A2 = 108 Hz. The frequencies of the first sixteen harmonics can be calculated by multiplying the fundamental frequency with the corresponding numerator of the frequency ratio of the harmonic in question (cf. Table 2). For example : F2 (f = 85,72 Hz), so the 15th Harmonics = f.15 = 85,72 x 15 = 1285,8 Hz. The notes with a large offset (+/- 30 cents) are always the 7th, 11th, 13th & 14th harmonics, with "+" ("-") indicating they are higher (lower) than indicated. Harmonic unison, harmonic octave, harmonic second, major & minor harmonic third, harmonic fourth, harmonic fifth, major & minor harmonic sixth are consonant. The harmonic series also contains the harmonic minor second (16:15) and the harmonic minor seventh or "septimal minor seventh" (7:4). The latter is also an interval not occuring between adjacent partials. Together (at times) with the harmonic fourth, the minor harmonic second and the minor harmonic seventh are dissonant. The 10 harmonic intervals at work in the harmonic series of every musical tone are the basis of what could be called a "natural" tonal harmony. However, for all kinds of reasons, musical practice deviates from this natural harmonic law, introducing a cultural harmonic practice and reinforcing it. This is fine as long as the deviation does not cause the sound to become too harsh and unmusical, hampering the experience of beauty. So although in music culture may & does alter nature, there is a limit to this. But this remains to a certain degree (inter)subjective. 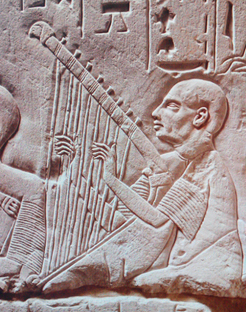 Blind Harpist with Harp tuned to a Heptatonic Scale ? Noise is a sound with an irregular, amorph frequency spectrum. A musical tone (note) is a sound defined by the Harmonic Series and its integer frequency patterns. Besides defining timbre or the "instrument color" of a tone when sounded, the Harmonic Series refers to six important frequency ratio's : 1/1, 2/1, 3/2, 4/3, 5/4, 6/5 (or the harmonic intervals of unison, octave, fifth, fourth, major third & minor third to the previous note). These play a fundamental role in the elaboration of the system of 24 tonic scales defining classical (tonal) harmony. This direct relationship between tonal harmony and the Harmonic Series is often overlooked. When two strings are tuned an absolutely beatless interval like the octave apart, the question of how to divide the octave gives rise to scales. A scale is an organized, attuned and characterisic "family of tones", all being frequency-wise relatives. Historically, the first scale to be formed was the pentatonic scale. To play on a six stringed harp, a pentatonic scale can be generated consisting of the fundamental tone (C), the octave of this tone (C) and four other notes (G, D & A). This scale of five steps : C, D, E, G, A, C (the first pentatonic mode), and all other pentatonic scales consist of tones having related frequencies with few beats. The members of each clan, family or team naturally co-operate because they continuously gravitate around each other, forming enduring dependent originations, the "solid" architectures of conventional reality. The pentatonic group of scales (set of families) was adopted by just about every human society. The pentatonic scales can be derived by the simple proportions given by five consecutive pitches from the circle of fifths : C, G, D, A and E. The ability to tune a harp to the pentatonic scale is the cornerstone of the development of music. While all notes on this scale sound "in tune" together (no major discord can be gotten), they do not define any stong "harmonic pull", i.e. the clear tendency of tonet to ask for tonet+1. The latter is the functional reciprocity of a tone in terms of the type or "color" of the family of tones to which it belongs. The pentatonic scales lack semitones. Therefore, every single combinates sounds euphonious. This also explains the staticity of pentatonic music. There is no real sense of harmonic transition or progression to be construed on the basis of the selected five tones. The circles of fifths, giving rise to the pentatonic scales, produce five pentatonic modes. The first pentatonic mode, with C as its first note or "tonic", is defined by whole note (T or two semitones) & a minor third (M or three semitones) : TTMTM. This minor interval of three semitones is the special feature of all pentatonic scales, giving this group a self-contained harmonic acoustic identity. The relative absence of harmonic push-and-pull dynamism (voice leading or harmonic progression) in the pentatonic system, gave rise to further subdivisions of the octave, introducing two new intervals (from C as first tone) : the fourth (F) & seventh (B), together dividing the octave in seven steps (for C) : C, D, E, F, G, A & B ; the heptatonic scale. The Greek modes were used in the Middle Ages and associated with spirito-acoustic properties. They continued to be used in Late Hellenism and the Middle Ages. In the Renaissance (starting in painting as early as the 13th century), individuality, coloration and stronger expressiveness begin to bloom, giving rise (in Modern Times), to the idea of specific "key colors", each family of tones expressing an overall timbre linked with musical ideas. The difference between a major & minor third, defined by a semitone, played a crucial role in this. Shades of loud beats ("major") and shades of softer beats ("minor") could be generated. The scales themselves had characteristic content & dynamic push-and-pull behaviors. Of the seven Greek Modes, only two were deemed to satisfy the conditions of well-organized harmonies able to express the "major" / "minor" contrast in the form of closely related families of seven notes. The Ionian mode, with its very obvious "full stops" at the end of every "harmonic sentence" (or combinations of simultaneously sounding notes), obviously became the foundation for the scales integrating the extraverted major third, while the Aeolian mode, with less obvious definite full stops, set the standard for the scales based on the introverted minor third. The Ionian pattern of TTSTTTS was applied to every note of the chromatic scale. This yields 12 so-called "major" scales. The first scale of this series is C major (C, D, E, F, G, A, B, C). The Aeolian pattern of TSTTSTT applied to the chromatic scale generates 12 so-called "minor" scales. The first scale of this series is a minor (A, B, C, D, E, F, G, A). On each of the seven steps (or degrees from I to VII) of the major scales, triads could be formed. In the major scales, the major triads are on I, IV & V, the minor triads on II, III & VI and the diminished triad on VII (the third & fifth are lowered with a semitone). In the (natural) minor scales, the minor triads are on I & IV, the major triad on V & VI , the diminished triads on II & VII, and the augmented triad on III (the fifth is raised with a semitone). The scales directly generated by the Aeolian mode were also called "antique" or "natural". Because these always end with an interval of a whole tone at the end (g - a in a minor), a clearer "lead tone" (one naturally moving towards the tonic) was introduced by raising the last step (g in a minor) with a semitone (to g# in a minor). This generated the harmonic minor scales. As this first adjustment brings about an augmented interval (f - g# in a minor), f was also raised to f# (in a minor). An augmented interval was preferably avoided in older music and is even hard to sing in tune today. This second adjustment generated the melodic minor scales. The change from f to f# (in a minor), i.e. the transformation of the antique minor to the melodic minor only occurs when the melody moves upwards. In a downward movement, f# is restored to f and the descending melodic minor returns (equals) the antique minor. This set of 24 scales defines the foundation of the classical, tonal harmony of Western music. While frequency in Hertz (the nominal lower frequency limit of human hearing being 20 Hz with a capacity to differentiate between two tones 1 to 2 Hz apart) gives the precise "location" of the tones, to further define scales, especially in terms of their tuning system, we need a unit to measure the distance (intervals) between these located tones, i.e. their frequency ratios. This unit is "cent" (c) or "one hundred", introduced by Alexander Ellis in 1875. This a logaritmic scale with 1200c to the octave. Given frequency ratio a:b, we get the following : cent = (log2 a:b) x 1200, or, given the fifth (3:2) we get : log2 3:2 = log2 (1,5) = 0,584963 x 1200 = 701,956c. Cents are used to express the size of the microintervals (intervals smaller than one whole tone). The fundamental question is : does the tuning system follow the acoustical laws of audition, objectively (Harmonic Series) and subjectively (structure & function of the human ear) ? Simply put, does tuning follow natural acoustic law ? Technically, this is the number of pure, harmonic intervals present in the scale. Equal Temperament has the least pure intervals present (namely one, the octave). But the octave merely delimits the scale, and does not functionally contribute to the division of the octave. So Equal Temperament is the less natural scalar definition. The harmonic intervals are the reference of all acoustically based tuning systems, for these are beatless intervals, i.e. acoustically pure and mathematically simple (integers instead of real numbers). They are also called "just intervals". Scalar definitions based on them are untempered. When the intervals are expressed as cents, the differences between the intervals of different tuning systems can be easily compared. In Equal Temperament, the standard tuning system, the intervals are always multiples of one hundred. This equalization of the microintervals is the cause of the "grayness" of this tuning system, eliminating the specific "key colors" of the tonal scales (eliminating the difference between the chromatic & the diatonic semitone, defining the semitone as 50c, tempering all octave-dividing intervals). Its main advantage is tuning facility (especially on keyboards) and standardization. Equal Temperament, commonly used everywhere today, has been rightly accused to "ruin harmony" (Duffin, 2007). There is no direct relationship between Hz and c. The former positions absolute frequency, the latter proportional position (or interval distance between tones). We need to know the standard tuning (or Master Tuning) to relate both values. Indeed, as a tone increases in pitch, its location changes and so also its distance from other static tones. But the Hz value and the cent value are not measured one-to-one, since often one value increases while the other decreases. In Western classical music and also in popular music, the octave is commonly divided in 12 steps, each step being a semitone. Before 1711, composers & musicians had no clear reference point to tune their instruments. Since 1939, an international consensus exists about concert pitch, with A4 = 440 Hz. This is 8 Hz sharper than Verdi pitch (A4 = 432 Hz or C3 = 128,434 Hz). Verdi pitch refers to φ (at A4 = 432 Hz, E3 = 161,817 Hz). The Golden Ratio (φ ≈ 1,618 ...) is also found in the ear as well as in the harmonic series. In the present study, concert pitch = Verdi pitch is part of the set of conditions related to the reintroduction of color & natural harmonic cycles back into music. (3) SCALAR DEFINITION : the tuning or temperament of the scale. Defines the interval-relationships between the tones of a scale. As the scale stays close to acoustically pure intervals (harmonic, just intervals), the frequencies of the tones (after which the notes are named) are related by ratios of two integers. The scale is "in tune" with the Harmonic Series. 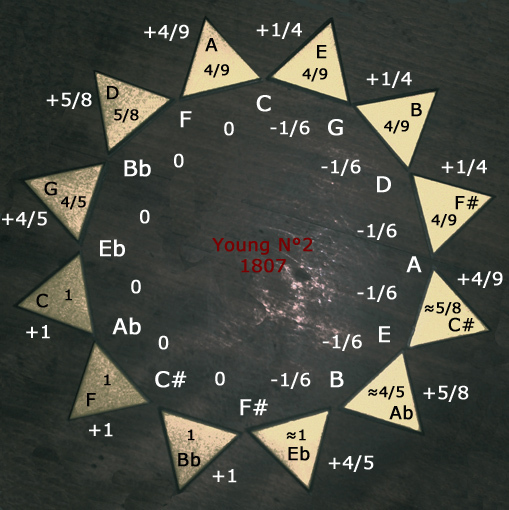 Historically, two tunings stand out : Pythagorean & Just Intonation. The former only uses the harmonic fifth (3:2), the latter all integer ratios, introducing limitations as to the complexity of these. So many variations of Just Intonation exist. But all these tunings generate a howling wolf interval imposing harmonic limitations. Before the 15th century, Western music was simple enough to avoid the wolf. With the Renaissance, these limitations were questioned and eventually left behind. The wolf had to be eliminated. To enhance the harmonic capacity of the scale, i.e. its ability to allow for an increased harmonic variety, accommodate a wider compositional intent and therefore be more useful in a broader variety of musical contexts, adjustments had to be made to the tones, creating intervals modified (tempered) from their harmonic, acoustically natural format. In this way, the power of the wolf diminished or could be rendered nearly harmless. Such tempered intervals are not based on ratios of two integers. The resulting scale is then called a "temperament" (because one, some or all intervals are tempered). The later is therefore a modification of a tuning, needing radical numbers to express the ratios of one, some or indeed all of its intervals. In musical practice today, the commonly used temperament is Equal Temperament (all semitones beings 50c, a whole tone 100c and so each step of the 12 steps of the scale 100c, up to the octave above at 1200c). It is the less natural of all temperaments ! Barbour (1951), identifying over a hundred historical tunings & temperaments based around the octave, categorizes them into five broad groups : Pythagorean Tuning, Just Intonation, Meantone Temperament, Irregular Temperament(s) and Equal Temperament. The first two are "tunings" (harmonic intervals only), the last three are "temperaments" (tempered intervals). Pythagorean Tuning defines all the notes & intervals of a scale from a series of perfect (pure) fifths with ratio of 3:2 = 701,956c, the third harmonic of the Harmonic Series (the first two being the fundamental frequency with its octave). This is easy to tune by ear. However, no matter how many fifths (3/2 intervals) one takes, either above or below a given note, one never arrives at an exact octave multiple of that note, but always a discrepancy larger, overshooting the target pitch, with a ratio of 129,746:128 or 1,013640625:1 instead of 1:1. There are 11 pure fifths and one narrow, out-of-tune fifth. To tackle this discrepancy, derive a complete chromatic scale taking a series of 11 perfect fifths. Indeed, no stack of 3:2 intervals fits exactly into any stack of 2:1 intervals (octaves). Take C, move up 12 fifth and then 7 octaves down. This brings one to B#, almost exactely where one started. The crucial discrepancy is the small interval (or comma) existing in Pythagorean tuning between two enharmonically equivalent notes such as C and B# (or Ab and G#). It is equal to the frequency ratio 312/219 = 531441:524288 (= 1,013643265 ...). Log2 (1,013643265) = 0,01955 x 1200 = 23,46c ; the Pythagorean comma or ditonic comma. "Now if one continues indefinitely adding fifths in an upward direction (setting up the circle of fifths), one is headed for infinity, for with the twelfth fifth a tone is reached which is also a comma higher than the octave of the original tone. (...) The ear is easily reconciled to impure fifths, if the discrepancy is very slight, as the equally tempered scale shows ; but it would not accept impure octaves." - Hindemith (1942, Book 1, p.31). Suppose we tune in D, then we first move six times a ratio 3:2 up : D - A - E - B - F# - C# - G#. We generate the the six other notes of the chromatic scale by moving six times a ratio 3:2 down : Eb - Bb - F - C - G - (D). If we add one more note to this stack, we arrive at : Ab - Eb - Bb - F - C - G - D - A - E - B - F# - C# - G#. This is very similar, but not exactely identical in size to a stack of 7 octaves. Indeed, it is a Pythagorean comma larger. Therefore, Ab and G#, when brought into the basic octave, will not coincide as expected. To get around this problem, the chromatic Pythagorean scale ignores Ab, and uses only the 12 notes from Eb to G# (C# but not Db, F# but not Gb, G# but not Ab, Bb but not A#, Eb but not D#). So only 11 perfect fifths are used to build the entire chromatic scale. The remaining fifth (from G# to Eb) is left out-of-tune ! So music combining those two notes is unplayable in this tuning. This very out-of-tune interval is the wolf interval (the 11 perfect fifths are 701,956c wide, in the exact ratio 3:2, except the solitary wolf fifth, which is only 678,495c wide = 701,956c - Pythagorean comma). In the case the notes G# and Eb need to sound together, the position of the wolf fifth can be changed. For example, a C-based Pythagorean tuning would produce a stack of fifths running from Db to F#, making F# - Db the wolf interval. As there is always one wolf fifth in Pythagorean tuning, playing all keys in tune is impossible. In music not changing key very often, or not very harmonically adventurous, the wolf interval is unlikely to be a problem, as not all 12 fifths will be heard in such pieces. Because 11 fifths in Pythagorean tuning are in the simple ratio of 3:2, they sound very "smooth" and "consonant". The thirds, by contrast, with relatively complex ratios of 81:64 (for major thirds) and 32:27 (for minor thirds), sound less smooth. Pythagorean tuning is particularly well suited to music which treats fifths as consonances, and thirds as dissonances. In the West, this means music written prior to the 15th century. Just Intonation is also based on the harmonic series, i.e. makes use of acoustically beatless intervals. Compared with Pythagorean Tuning (only using 3:2), Just Intonation arrives at other frequency ratios for the intervals. Various systems of Just Intonation were designed. Usually, a limit is imposed on how complex the ratios used in Just Intonation are. Just Intonation 7-limit implies there is no prime number larger than 7 featuring in the ratios. Wolf intervals also occur and hence the same problems as with Pythagorean Tuning persist. The first temperaments date from the 15th century, while the earliest discussions happened a century earlier. The exclusive use of the perfect fifth (Pythagorean) or other harmonic intervals (Just Intonation), causing a wolf interval, limited the harmonic possibilities of composers & musicians. The major thirds in Pythagorean were too wide and the minor thirds too narrow. In Meantone Temperament, the whole tone is precisely half of the harmonic major third (386,314c/2 = 193,157c). It rejects the wide Pythagorean third and seeks to establish the harmonic major third by tempering certain fifths. Eventually, Meantone Temperament sought to "close" the circle and eliminate the wolf interval. The wolf remained. The idea underlying Meantone Temperament was to make the major third as acoustically pure as possible. However, in a twelve-note octave, a circle of pure major thirds does not fit in (three pure major thirds = 5:4 x 5:4 x 5:4 = 125/64 or 1,953:1 instead of 2:1). In the Renaissance this was not really a problem, because composers did not use all the major thirds. Moreover, they did not notate music with more than two flats, and rarely with sharps. To make the thirds sound good, the fifths were narrowed (the harmonic fifth of 701,956c became the meantone fifth of 696,57843 in 1/4-comma or 698,3710 in 1/6-comma). This was the disadvantage of this system. But in combination with perfect euphonious thirds, these tempered fifths were tolerable. To achieve acoustically pure major thirds, four consecutive fifths in the circle were tempered by one-quater of the difference between Pythagorian and pure major thirds. This difference of 21,506c (407,820c - 386,314), with ratio 81:80 (21,5064c) is called the syntonic comma, diatonic comma or Ptolemaic comma. This is the temperament know as "quater-comma" Meantone. Here we have eight pure thirds and four thirds which are really diminished fourths. The syntonic comma was spread over four fifths. In the 16th century, it was suggested to spread the comma over five or six fifths, causing less differentiation between the four "bad" thirds. The eight "good" thirds (393c) were no longer harmonic thirds (386c), but sounded good while the fifths were better. These are the one-fifths or one-sixth-comma Meantone Temperaments. In none of these systems was the wolf interval eliminated, and so the 24 keys were not all available (some chords sounding out-of-tune). But in all of them the harmonic fifth & major third were prominent. "The strongest, most unambiguous interval, after the octave, which is unique, is the fifth, while the most beautiful is the major third, on account of the triad formed by it with its combination tones." - Hindemith (1942, Book 1, p.88). For Hindemith, "the frequency of the combination tone is always equal to the difference between the frequencies of the directly produces tones of the interval" (p.61). With the discovery all fifths did not have to be tempered the same amount, a new group of temperaments emerged. These "irregular" temperaments mixed different amounts of tempering and so called for different sizes of fifths & thirds. By this adjustment, mixing harmonic & tempered fifths, the wolf interval could be driven out (closed temperaments) and more chords created. This assisted composers who intended to write chromatic lines and complexer harmonies (with sharp & more than two flat signatures), like diminished and seventh chords. The idea was to make all 24 keys around the circle of fifths become available (circular temperaments). All the notes & chords of the set of 12 major & 12 minor keys sounded "well" together ! The tirany of the wolf interval, limiting full harmonic expression, had ended. A harmonic logic with more categories & rules could be invented. If the studies of Lehnman are correct, Johan Sebastian Bach was the first composer to musically acknowledge the crucial importance of this in his Das Wohltemperierte Klavier (BWV 846–893). The word "wohl" does not refer to "equal", but to the euphonous qualities of the 24 tonal scales in Bach's irregular temperament. Because of the variety of intervals within these irregular temperaments, each key had its own harmonic characteristics or "key color". Indeed, the flavor of the chords was slightly different in each key. Bach's temperament keeps C, D, E, F, G & A in evenly-spaced positions, at their normal place within the context of late 17th century practice. Then six remaining notes (B and the sharps F#, C#, G#, D# & A#) are put in place with adjustments making them also serve well as flats. A staggering variety of irregular temperaments saw the light, each temperament having its own advantages and disadvantages. Some favored certain chords & keys, while others did not sound well. Or they sounded more or less all good, but were very difficult to tune. In the tuning world, some of these systems are known under the name of their inventor : Andreas Werckmeister, Johann Philipp Kirnberger, Johann Georg Neidhardt, Antonia Vallotti, Thomas Young and many others. Irregular temperaments always leave certain fifths untempered. For example, in Young's temperament n°2, a superb example of simplicity & elegance, 6 fifths (C - G - D - A - E - B - F#) are tempered by 1/6 of a Pythagorean comma, while the 6 others remain harmonical (pure, beatless, acoustically perfect). Young N°2 starts the set of tempered fifths with C as "scalar center", making the key of C# (Db) beat the most and the key of G the less. If the scale would start with F, F# (Gb) would be the worst and C the best, etc. The fifth (for example : C - G) is tempered with 1/6th of a Pythagorean comma (or 23,460c/6 = 3.910c), or a perfect fifth (3:2) of 701,956c - 3.91c = 689.046c. Young N°2 defines the minor third harmonically (32:27). "What then, is the minor triad, in reality ? I hold, following a theory which again is not entirely new, that it is a clouding of the major triad. Since one cannot even say definitely where the minor third leaves off and the major third begins, I do not believe in any polarity of the two chords. They are the high and low, the strong and weak, the light and dark, the bright and dull forms of the same sound." - Hindemith (1942, Book 1, p.78). "Again we may say that Young's version is an excellent irregular temperament ..." (Barbour, 1951, p.181). The trouble with these mathematically excellent systems "is that they are too good !" (Ibidem, p.178). The step from "paper" to "practice" is difficult and involves hearing the beats of the beating fifths. In our age, assisted by electronics, tuning & retuning has become a mere preset. Already known in Antiquity (Aristoxenus in the 4th century BCE), who preferred another system, Equal Temperament became an issue around 1640, if not earlier. The father of Galileo Galilei (Vincenzo) advocated the system and composed dance suites on each of the notes of the chromatic scale (in all keys). The octave (of 1200c) is divided into 12 of 100c and a whole tone divided in two semitones of 50c each. The scale is constructed by way of 2n/12 (n = 1 for C -unison- and n = 12 for C' -octave-). All steps are tempered by 1/12 of a Pythagorean comma, or 23.46/12 = 1.96 cents. In the past, theorists as wel as musicians found Equal Temperament coarse, disagreeable (Thomas Smith), with a beating heightening emotion (Johann Neidhardt). "... the ear is subject to a certain danger in being exposed only to music constructed of tempered intervals ; it accustoms itself to their clouded qualities, and like a jaded palate loses its sense of natural relations." - Hindemith (1942, Book 1, p.28). In Equal Temperament, major thirds (400c) are far too wide compared to the harmonic major third (386,314) and minor thirds (300) too small compared to the harmonic minor third (315,641), creating an unpleasant, coarse "beat". In all previous systems, the tone (of 9 commas) had been divided in a minor (4 commas) & a major (5 commas) semitone. This was abolished. The relationship maintained between the Harmonic Series was also eliminated. Each step of the scale is tempered. Hence, except for the octave, no acoustically pure intervals remain ! This means this temperament breaks with the underlying acoustical phenomena. This scale moves too far away from natural law to allow for color. This is the dictate of unnaturalness. The uniform intervals lack expressive variety, making the 24 keys loose their characteristic harmonic "coloration". Keys are merely shades of gray. In terms of the Farben Project, tempering all intervals except the octave means the end of coloration and this is precisely the opposite of its intent. It wants to generate color. (3) scalar definition : all tunings & temperaments are possible and should be used as a function of the music in question. Young N°2 is the best temperament. Equal Temperment is a default accommodating standardisation. It is the worse. The impact of music on the human being, besides auditive input, is mainly through resonance, the vibration imparted on the psycho-biological system as a result of sound waves from one or more sources of sound, if possible musical instruments. These resonances happen all through the body. If these vibrations are in harmony with the laws of acoustics (in terms of the harmonic series and the φ-base of human hearing), then this impact is wellness, or beatlessness. If, due to the beating between the overtones of these sound waves, pure vibes cannot be maintained, a disturbing resonance is at hand. In louder form this becomes auditive pollution. Psycho-acoustics aims to entrain the listener by way of sound waves most likely to trigger the natural restoring response of a system vibrating in tune with the acoustics of the harmonic series, the human ear and color. This brings the visual into the equation, opening the way for combining music & color during performance (Scriabin, the color organ). Eventually, this may lead to an individualized & audio/visually scripted entrainment, a session running HRV feedback & EEG-driven (like Mind Work Station & Bioexplorer), with parameters set to specific targets. How to find a series of plausible Psycho-Acoustic criteria ? On the basis of my various hermeneutical studies on religious language & practice, provisional "esoteric" tables of correspondences can be put together (cf. Tabula Tabularum Esotericum, 2006). Of these various correspondences, let us analyze the relationships proposed between the energy-wheels of the subtle energy-body (in Taoism, Hinduism & Buddhism), states of yogic consciousness (in Classical Yoga) and the symbolic language of the Qabalah (with its numerical, astrological, alchemical and psycho-dynamic semantic charts). Especially the Chakra's (energy-vortices) are interesting, for there are seven main energy-fields, each associated with a spectral color. These wheels also associate with certain functions, cognitive modes and proposed brain frequencies. These correspondences may be used to compose music intended to have psycho-acoustic effects. The question then is : How to translate the criteria into an intented effect and this into a piece of music ?